I first saw Charlotte Rampling in Swimming Pool, a solid French/English thriller that allowed Rampling to shine as a deep dramatist, while still giving us a insecure character that we could understand. Though not a perfect film as a whole, it had a lot to say about jealousy, aging, women, sexuality, and the darker side of the mind. The same could be said about 45 Years, though the premise is much less in-your-face. The message is deep down, requiring you to reach farther and dirty yourself further in order to grasp the concept, but that only aids the film in becoming something more than strong. 45 Years is one of the better films I’ve seen this year, and should get its due recognition. Kate & Geoff Mercer are preparing to celebrate their 45th wedding anniversary in a small English town. The couple is retired, childless, a bit lonely, but overall happy, and this party is something they’ve been looking forward to since five years earlier when Geoff had a surgery that required them to cancel their 40th celebration. But in the week leading up to the event, a letter comes to Geoff that will shatter the couple’s seemingly idyllic life. In his 20s, Geoff fell in love with a woman, planned to marry her, but lost her in a tragic climbing accident. Her body has just been discovered, locked away in ice in the mountains, but the emotions attached to her come flooding back with a vigor that Geoff had all but forgotten. Now Kate must wade through her feelings of jealousy for this lost love, even as she uncovers more secrets surrounding Geoff’s past life, all before the couple’s marriage will be on display before all their friends come the weekend. 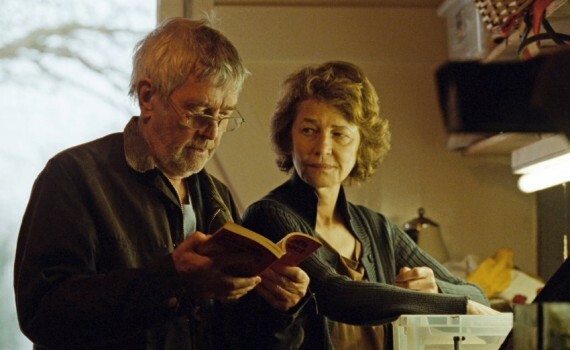 45 Years is a slow burn if I’ve ever seen one, but one that rewards our patience with great drama. Not that there’s a knife-chase scene in which Geoff is revealed to be a serial killer or anything; it isn’t that type of film. But twists will occur, and even small ones can be enough to throw off the balance of a relationship that has been based on the past much more than either Kate or Geoff has ever been able to admit before. There is a lot being said here about old love, whether it vanishes or not, how it affects future love, how both parties in a relationship deal with it. And getting old, man, rarely has that topic been broached so carefully and so expertly as in this film. It’s a movie that you should be wary watching, not for any typical Hollywood reasons, but because the emotions buried deep down might just surprise you with their ferocity & truth.